The Jennings Family: Hunter's Kindergarten Spring Program! Hunter had been counting down the days until his school program since they started back to school in January! He was so excited! And really, we all were excited! I'm so thankful Ben and Honey were able to come and watch! Here are some pictures and videos from his program! This is the song they started with and if you listen at the end you can hear a "Hi Bubba" from Archer! He was so excited he got to play the drums during one song! He was front and center in this song! Maggie is still singing this song around the house! And here is the reason he is wearing all those buttons. 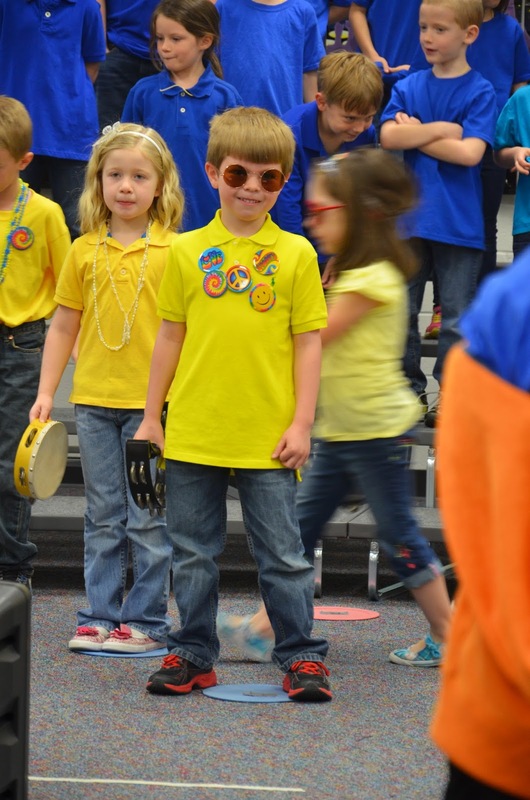 They sang a song called Tambourine Kid and so he was supposed to bring 70s things he could put on quickly. I thought he would wear maybe one or two buttons... nope all 5! Love him so much!! He did so, so good!! We are so proud of Hunter!! I can't believe his kindergarten year is almost over! We are so blessed by this little man! Thank you, Lord for your many blessings! After the program we got to go back to Hunter's room and have cookies. Maggie and Archer really liked this! Ben and Honey were both really excited to meet Kinnick. Hunter loves her! She sits right across from Hunter and is the one friend he is always talking about. He loves all his friends at school, but there is a special place in his sweet heart for Kinnick! He is always praying for her. Maggie was really excited to finally meet her, too! Way to go Hunter!!! We are so very proud of you!